First birthday celebration of Keelikolani’s birthday, 1871. Birthday of the Alii, the governess of Hawaii. On the 9th of February past, a banquet was held on the estate of Hulihee by the person whose birthday it was, R. Keelikolani, assisted by her dear makaainana remaining, and her personal attendants; there was much food prepared by the one whose birthday it was, this being the very first celebration of her birthday; and it was appreciated for the calmness of the day. There were many gathered to celebrate her day of birth, with their gifts for that day, and at 2 o’clock, the feast began, followed by Hawaiian entertainment [lealea Hawaii] furnished by the one whose birthday it was. Here are is the main thing which I saw and all of us as well, that being the skill of the person who instructed the entertainment [o ke akamai o ka mea nana i ao i ka lealea], and this was followed by a joint choir of the sweet-voiced children of Holualoa; we and they give praise to the excellent leadership of Aalona; but this is what I did not like the most, along with my friends who stood with me, that being the guiding of some children to stand up and go astray [eia nae ka’u wahi hoahu loa, a me ko’u mau hoa e ku pu ana, o ke alakai ana i kekahi mau keiki liilii e ku iluna e lalau ai], and for that some women went and “kissed the nose” [honi i ka ihu] of the small children who were probably no more than ten years old. 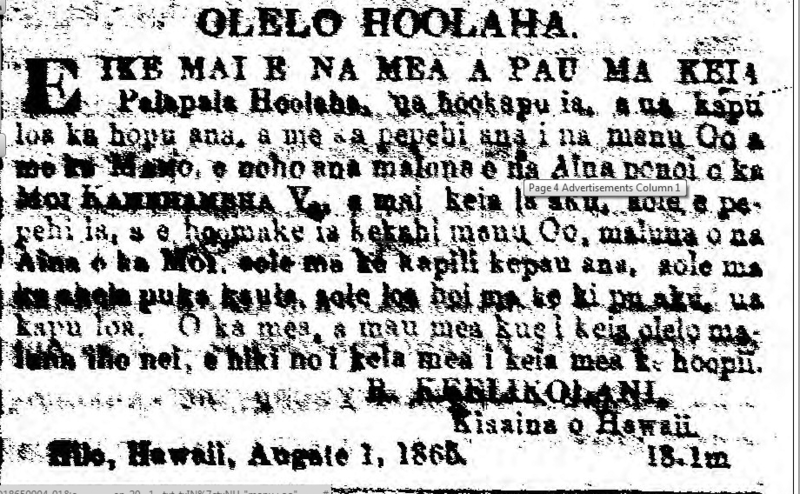 Kailua, Kona Akau, Hawaii, Feb. 10, 1871. 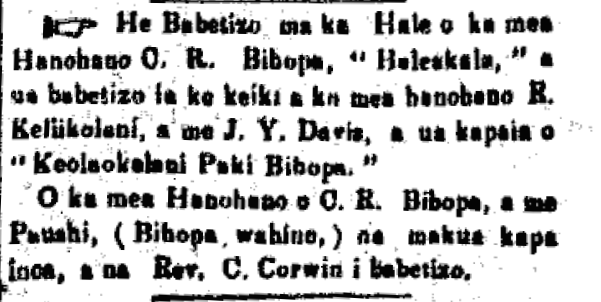 Ka Nupepa Kuokoa, Buke X, Helu 8, Aoao 2. Feberuari 25, 1871. The Honorable C. R. Bishop and Pauahi (the wife of Bishop) were those who bestowed the name, and Rev. C. Corwin is the one who performed the baptism. Ka Hoku o ka Pakipika, Buke 2, Helu 18, Aoao 2. Feberuari 12, 1863.